Irony Pink Doll Stroller Baby Carriage Foldable with 4 Wheels with Hood by Huang Cheng Toys at My Pregnancy Place. MPN: 8168. Hurry! Limited time offer. Offer valid only while supplies last. 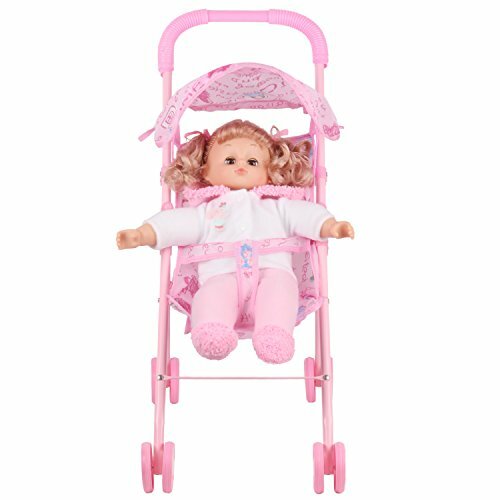 This doll stroller is the wonderful toy which can be given to kids. Our children will play for hours and use their imagination with this senior toys. This doll stroller is the wonderful toy which can be given to kids. Our children will play for hours and use their imagination with this senior toys. Not only for girls, but the boys will love it with the satisfaction of being parents! This doll stroller is constructed from high quality metal and fabric. It has a fold-able hood and seat holder. It is also easily fold and unfold. So when is not in use, it will not take up space. Exquisite craftsmanship and sturdy material ensure this toy will serve for a long time. The doll photograghed is not included. Characterized by pink frame and handle with lovely-designed hood, a store basket and a seat holder. Easy to unfold and fold compactly for easy storage. Comes fully assembled. Doll photograghed is not included. Provides an authentic holding stroller for your children's doll with its emulational appearance. If you have any questions about this product by Huang Cheng Toys, contact us by completing and submitting the form below. If you are looking for a specif part number, please include it with your message.